This page describes LiFi MAC layer basics. It mentions LiFi PHY frame structure and LiFi MAC frame structure. 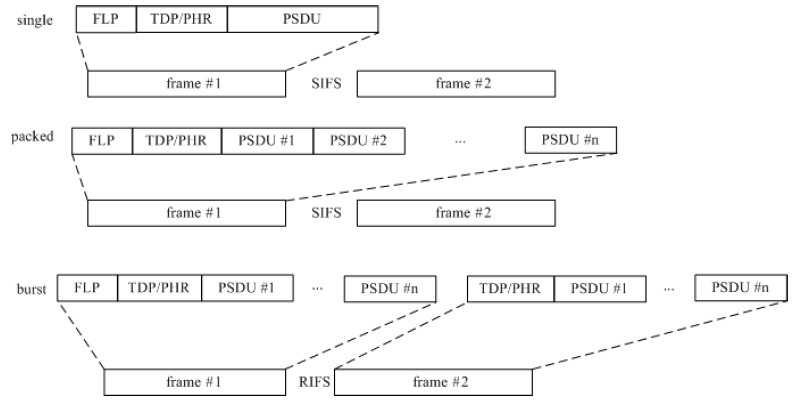 • Single mode: In this mode, frame carry one PPDU per frame. It is used for short data communication e.g. ACK, Association, Beacon etc. • Packed mode: In this mode, frame carry multiple PPDUs destined for same destination. This mode improves the efficiency of MAC layer as it eliminates repetitive PHY and MAC headers for the same destination. • Burst mode: In this mode, frame uses PHY preamble with reduced length after the 1st frame. Moreover it uses RIFS instead of SIFS. Hence this mode incerases efficiency and also improves the throughput. • Dimmed OOK mode: It is used for data transfer in dimming applications. The figure-1 depicts different LiFi frame modes. LiFi system uses PHY frame consisting of preamble, PHY header and PSDU. The same has been shown in the figure-2. Multiple octets are transmitted least significant octet first and in each octet least significant bit first. Preamble: It is used by the transceiver to perform optical clock synchronization. FLP (Fast Locking Pattern) consists of alternate one and zeros. Four TDPs (Topology Dependent Patterns) distinguish PHY modes used. Every alternate TDP pattern is inverted to achieve DC balance in the LiFi Physical layer. PHY Header: It is transmitted along with OOK modulation type. It carry burst mode, channel number, MCS ID (defines PHY type (PHY-I,II or III) and data rate), PSDU length etc. HCS: It is 16 bit in size. It is used to protect PHY header in LiFi Physical layer. There are optional fields in teh frame used in PHY-I mode at clock rate of 200 KHz. PSDU Field: This field has variable length. It carries data of PHY frame. This is described below under MAC frame section. LiFi MAC frame consists of MHR, MSDU and MFR. Frame control field carried in MHR is of size 2 octets. It is composed of frame type, addressing fields, control flags. The MAC frame type is 3 bits long. It is used to differentiate different frame types e.g. Beacon, Data, Acknowledgment, Command, CVD etc. Source and destination addresses are 16 bit or 64 bit long in size.